Saudi Arabia is slashing shipments of crude to the United States, a move that appears calibrated to boost oil prices after a swift and punishing sell-off. The move could put the kingdom at loggerheads with President Donald Trump, who wants to drive down energy costs for Americans and frequently accuses the Saudi-led OPEC cartel of jacking up oil prices. The Saudis are loading fewer barrels on ships bound for the United States this month, continuing a trend that began in September, according to an analysis by tanker-tracking firm ClipperData. The firm’s loading estimate suggests that U.S. imports of Saudi crude oil could soon fall toward the lowest levels on record. Sending fewer barrels to the United States means U.S. crude stockpiles are more likely to drop, and shrinking inventories tend to push up oil prices. It’s a tactic the Saudis used last year to amplify their main strategy for draining a global crude glut and propping up the market: cutting output alongside fellow OPEC members, Russia and several other producers. The maneuver shows how Saudi Arabia’s efforts to manage the oil market have evolved. During the 2014-2016 oil price crash, traders closely monitored weekly U.S. stockpile data to see whether oversupply was shrinking or growing. As the world’s biggest exporter, Saudi Arabia realized it could nudge the data in a direction that boosts the cost of crude. 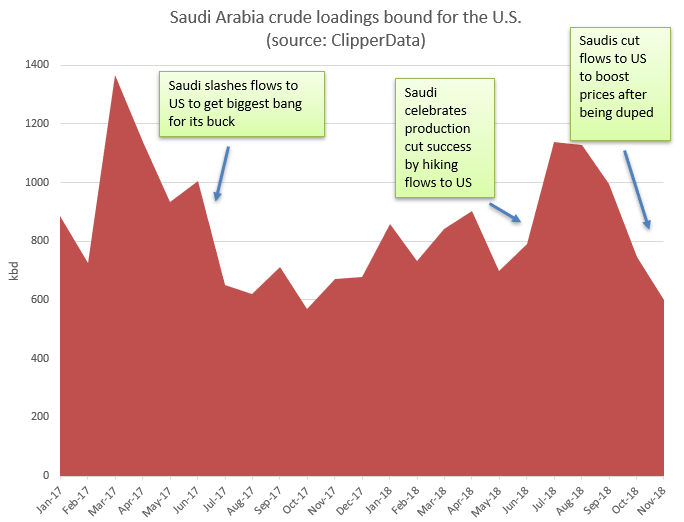 “It worked so well in 2017 for [the Saudis] to cut flows to the U.S. because people could see the inventories dropping because U.S. data is so timely and transparent,” said Matt Smith, head of commodities research at ClipperData. November’s drop in Saudi barrels bound for the United States follows a six-week oil market rout that saw prices plunge 25 percent into bear market territory. It also comes after Saudi Energy Minister Khalid al-Falih warned on Monday that OPEC, Russia and several other producers may soon launch a fresh round of price-boosting output cut. Shortly after Falih issued the warning, Trump took to Twitter to voice his disapproval with that plan.